Barbara and I moved to California in 1983. When Thanksgiving came around, we didn't want to fight travel and weather by returning to Denver for the holiday, so we joined our friend Jack for "orphan Thanksgiving" at his parents' place in Palos Verdes. And hey, as long as we were in SoCal, we visited Disneyland! That was so much fun that we did the same thing the following year. Within a couple of years, Jack stopped making the trip, and we dropped the pretense of visiting his parents: we went to Disneyland for Thanksgiving. Over the years, the details varied, but we kept up the tradition. Sometimes we left the park for a nice dinner; sometimes we had turkey at Disneyland; sometimes we sat on a Main Street curb and enjoyed bulbous corn dogs. In the beginning, we crawled along U.S. 101 at the speed limit; eventually, I became a Californian and learned to go 80 MPH down I-5 like everybody else. We've driven on roads that are upgraded and yet more clogged, seen Casa de Fruta get its own exit, and watched the birth of innovations like drive-through Starbucks. Disneyland itself has undergone massive changes and is now very busy on Thanksgiving. Every year, for 21 years now, we've gone to Disneyland for Thanksgiving weekend. Jess is 18 and Devi is 9, and they've never spent the holiday anywhere else. It's great fun to go, and it's nice to get home. Hi, I'm blogging from the Apple Store at South Coast Plaza in Costa Mesa. Whee! Happy Thanksgiving weekend, everybody. A baby was conceived on the Danish version of the TV show Big Brother. Apple now sorta makes supercomputers. Story here. 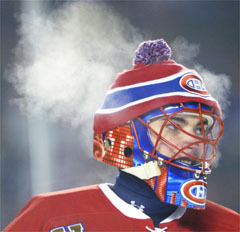 "When I was 11 or 12 years old, I remember my mom always said, `Put a tuque on, you'll catch a cold,' " said Theodore, who wore a ski cap over his goalie mask and stopped 34 shots. "I just wanted to make sure she's not going to say anything when I go back home, so I put a tuque on." I went to see my dentist, Dr. Ron Pack of Sunnyvale, on Tuesday. I was shocked to discover that I had 4 cavities, in 3 different parts of my mouth. I rarely get any cavities. It was probably the result of my extended visit to Denver, during which I ate plenty and didn't keep up good brushing habits. I went back on Thursday to get those little holes plugged. It took less than an hour and was nearly painless. Even when the novocaine faded and I could find my mouth again, it hardly hurt. As usual, I attribute this to the work of Dr. Pack, the world's best dentist. I recommend him highly: 408-245-5812. In Mac OS X 10.3 Panther, the Font Book and other font features are really cool. When it comes to fonts, I am strictly a junior user -- no fancy typesetting jobs for me. But I've had fun playing with the over-the-top (for me) wacky font features. Font Book lets you make little collections of your favorite fonts and has a slider that lets you zip through viewing different sizes of a font. The standard font panel, available in most apps that let you enter text, has a whole set of controls just for text shadows. My favorite font feature is available in any app with a font panel or a "Special Characters" item in the Edit menu. 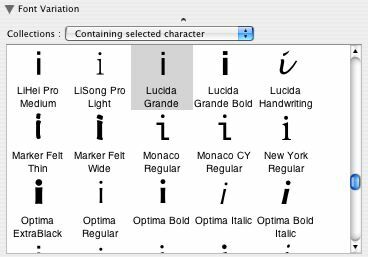 There's a panel called Font Variation that shows how any character appears in every font of a font collection, or if you want, every font you have installed. So, if you'd like to pick out a really cool looking lowercase "i", you can see them all at once and choose the one you want. If you need to print a biggish document and you don't have a job that gives you free access to a Behemoth-2000 photocopier, you might end up at Kinko's. It turns out that Kinko's is even more convenient than I thought. You can upload your document via the Kinko's web site and ask them to print it for you, then pick it up a few hours later, and the price is not insane. I uploaded a 180-page PDF on Sunday night at 11:00. It was ready at 8:00 Monday morning, and they charged me $13.50. They even sent me e-mail to let me know it was ready. Pretty cool. Larry Niven's classic Man of Steel, Woman of Kleenex, about what might happen if a real Superman and Lois Lane ever actually hooked up, is now available online. Thanks to Chuq for the link. NOTE: this venerable story is not updated to reflect the fact that Supes and Lois have been married in the comics for some years now. Also, note some quaint old notions, such as an unmarried woman getting thrown out of school because she's pregnant. Yes, that really used to happen, kids. Yesterday a couple of buddies and I had lunch at the Sourdough Eatery, a classic quirky place near downtown San Jose. There are a zillion signs everywhere telling you what the combos are and what you're allowed to buy ("Drink purchase with lunch ONLY! "), bizarre furnishings, and hundreds of oil paintings (mostly portraits of famous people) done by the co-owner, a woman who also makes your sandwich. Hundreds of dollar bills are pinned to the ceiling. It's a treasure. Other bizarre Silicon Valley hangouts I have not been to but have always wanted to try: Mark's Hot Dogs, which is located in a giant orange dome, and Sputnik's (search for it on the page), which makes the Sputnik, "a blob of deep fried dough cut in half and stuffed with ground beef, pickles, lettuce, tomato and sauce".